Visit the Columbia Pike Branch Library on the First Friday of each month from 7 - 9 p.m. for an after-hours, all ages dance party! Cash bar by New District Brewing Company; 21+ only with valid ID. Nov. 3 - Caz Gardiner - She's got the rock! She's got the soul! She's got the reggae! She's got the moves and the band to deliver the grooves! 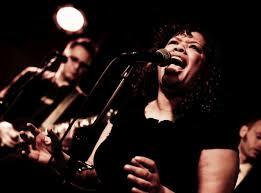 Caz is a Washington, D.C.-based singer/songwriter who performs soulful rock and reggae with her own backing band. RSVP for an event reminder. For more information, call 703-228-5710. Co-sponsored by ArlingtonArts and Arlington Public Library.